Launch of a SpaceX commercial cargo ship on an initial test flight to the International Space Station, originally planned for Feb. 7, is expected to slip to at least the end of March, officials said Friday, to give engineers time to complete additional hardware and software testing in the wake of a recent simulation, software analysis and work in Florida to close out the craft for flight. The company has not set an official target launch date for its Dragon cargo carrier, but the long-awaited mission is not expected to fly before March 20 and it could slip to early-to-mid April depending on what it takes to shoehorn the flight into an already busy space station schedule and to book a slot with the Air Force Eastern Range, which orchestrates all East Coast launches. Three of the station's six crew members plan to return to Earth March 16, a European cargo ship is expected to arrive March 19 and three fresh crew members are scheduled to dock on March 31. SpaceX, headquartered in Hawthorne, Calif., has a $1.6 billion contract with NASA to provide 12 cargo flights to the station for delivery of more than 44,000 pounds of equipment and supplies. The contract may be expanded to cover additional flights, boosting its value to some $3.1 billion. Three test flights were planned by SpaceX under a separate contract valued at up to $396 million. 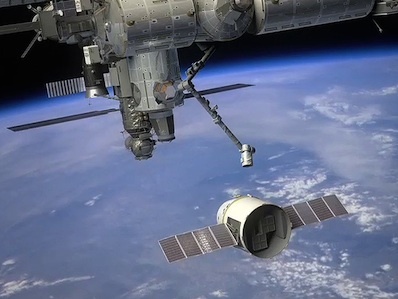 The first flight was successfully carried out in December 2010 when a Dragon capsule was lofted into orbit atop a SpaceX Falcon 9 rocket and guided to a successful splashdown in the Pacific Ocean, the first commercial spacecraft ever recovered from orbit. As originally envisioned, the second test flight would have tested rendezvous procedures and included a close-approach to the station, but berthing would have been deferred until the third flight. SpaceX successfully lobbied to combine the second and third test flights into a single mission and hoped to launch it Feb. 7. But on Monday, the company announced that launch was on hold pending "additional work" that would "optimize the safety and success of the mission." NASA sources said the company ran into problems with the planned rendezvous profile needed to guide the Dragon capsule to the space station. NASA dispatched a veteran flight director and trajectory analysts to Hawthorne to help SpaceX get to the bottom of the issue. Sources also said SpaceX engineers had encountered an electromagnetic interference issue with one or more components in the Dragon capsule. A SpaceX spokeswoman confirmed that an EMI issued had been discovered during testing, but she characterized it as relatively minor. Likewise, Lindenmoyer downplayed the technical issues, saying "it's just good practice to wring out your hardware, your software, your operations to make sure you're in the best possible shape for a good successful mission." In a telephone interview, he said SpaceX engineers identified three areas requiring additional work. "Down at the Cape, the rocket's in good shape, it's ready to go," he said. "This is the first time they're checking out and integrating the Dragon with all its new systems on it. So I would say down at the Cape they're taking some extra time just to complete a full checkout of the vehicle and complete some integrated systems testing down there. ... They're closing out all the, what they call 'open tickets' on anything that needed resolution before they button it up and get it n final shape for flight." At the SpaceX factory in Hawthorne, meanwhile, "their software engineers have been so busy finishing up the integration work with the integrated testing with the station and making sure everything they learned coming out of that testing was properly implemented into their software, they wanted to take some extra time and just do a good, solid job of software mission assurance testing. "And they recognized they really hadn't tested the software to the same extent that they did for that previous flight and their engineers reported that to (SpaceX management) and they decided well, you know, they're going to take the time that's needed to make sure they're comfortable that flight software's ready to go." Finally, Lindenmoyer said a recently completed integrated simulation with NASA flight controllers in Houston and SpaceX engineers in Hawthorne revealed procedures issues that needed additional work. The simulation "actually went very well," he said. "But there are lessons learned that come out of simulations like that and folks want to understand the outcome of that sim and then tweak up some of their processes and tools so that things go smoothly when it comes ready for flight." He said sending a NASA flight director and trajectory experts to Hawthorne was just a matter of "exchanging our experience and our lessons learned, that's part of the partnership." "We're working with SpaceX to just help them through the complexities of doing a joint operation," he said. "I would say it's just a normal part of our partnership. After conducting the sim, some of the mission ops folks went down to SpaceX and they reviewed their tools and processes with them and are tuning them up so that they can be in top shape for the mission." Asked whether the issue was a potential show stopper, Lindemoyer said "I'm not aware of anything being in that bad a shape. To me, it's just a matter of becoming proficient and making sure all the procedures are in place, all the tools are in place to react to whatever's needed during the realtime operations. But I'm not aware of anything being broken. It's just a matter of becoming proficient. Lindenmoyer said he plans to visit SpaceX next week for a status report and discussions about when it might be possible to conduct an initial readiness review.